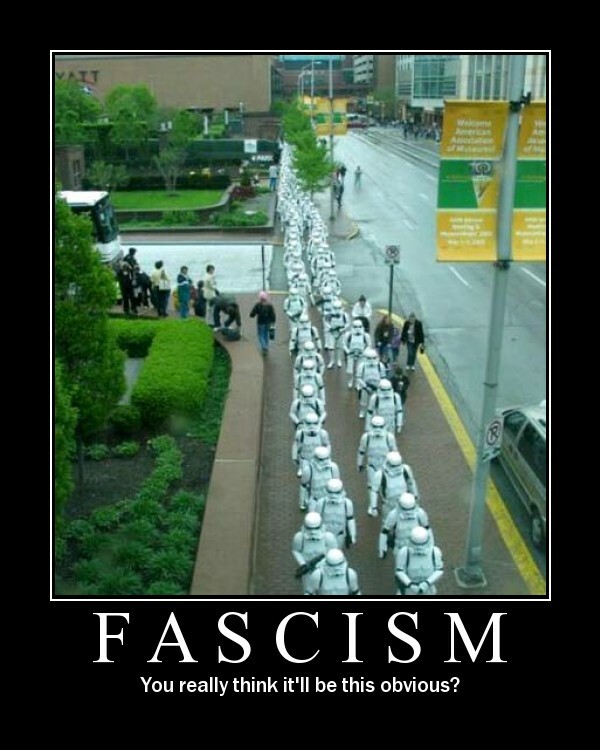 Only Fascism Can Liberate America! Because some people are too stubborn or too stuck in dysfunctional thinking patterns to hear the truth about fascism when it hits them over the head, I suggest that we try a different approach: Parody. When a comic does satire -- an exaggeration of what we're thinking -- it can wake us up, so that we can see the truth and laugh at how we've been acting. That can give us the freedom to stop doing the same dumb thing and to try something new. Torturing People Makes Them Like Us! We Need to Destroy America in Order to Save Her! A "Decider" King is What Our Founding Fathers Wanted! Supressing the Truth is What Makes Us American! Big Brother Is Our Friend! Don't Investigate 9/11 . . . The Truth Might Be Scary! We Need a Dictator In Order To Save Our Freedom! they also make great bumper stickers. Only terrorists. question their government......It's true! I heard it on the news! They hate our freedoms? ....The government can fix that with the PATRIOT ACT ! WISDOM on Wed, 12/12/2007 - 3:03pm. Don't investigate 9/11. Go back to sleep! Don't critique the official conspiracy theory myth on 9/11, you might have to join the club. Sacrifice your liberty for security because the prisons are full. chucksheen on Wed, 12/12/2007 - 3:11pm. Empires are always at war. After all, the peace must be maintained. We must give up our freedoms in order to have liberty: Patriot Act. I don't like the New World Order -- give me Globalization! ProfJones on Wed, 12/12/2007 - 4:17pm. 1) Thank U Bush, for making US less hated: "They hate us for our freedom and prosperity." "Let us never tolerate outragous conspiracy theories concerning the attacks of Sept. 11"
highcard00 on Wed, 12/12/2007 - 7:34pm. PhoenixRising on Thu, 12/13/2007 - 1:11am. imgstacke on Thu, 12/13/2007 - 5:11am. This is an excellent post. Humor is a very effective tool for spreading a message. It can plant the seed without challenging too strongly deep rooted currently held belief systems, which people generally find intimidating.
" I think it would be a good idea." jwtruther on Thu, 12/13/2007 - 11:10am. And/or someone like them and their shows. I've also been looking for some 9/11 Truth humor infiltrating political comedy routines but I haven't seen any yet, except for maybe an occasional anti-9/11 Truth or "conspiracy theory" joke at our expense. It's all slowly but surely infiltrating the American psyche and culture, but too slowly. PhoenixRising on Sun, 12/16/2007 - 2:42am.